I think it’s hard to craft for men. Not sure exactly what the problem is, but I often find it difficult to come up with nice handmade gift ideas for the younger and older men in my life. Maybe as the new baby grows my idea store will grow with him. In the meantime, I did think of a nice gift for my father-in-law’s birthday, and this one was handmade by Dorothy. 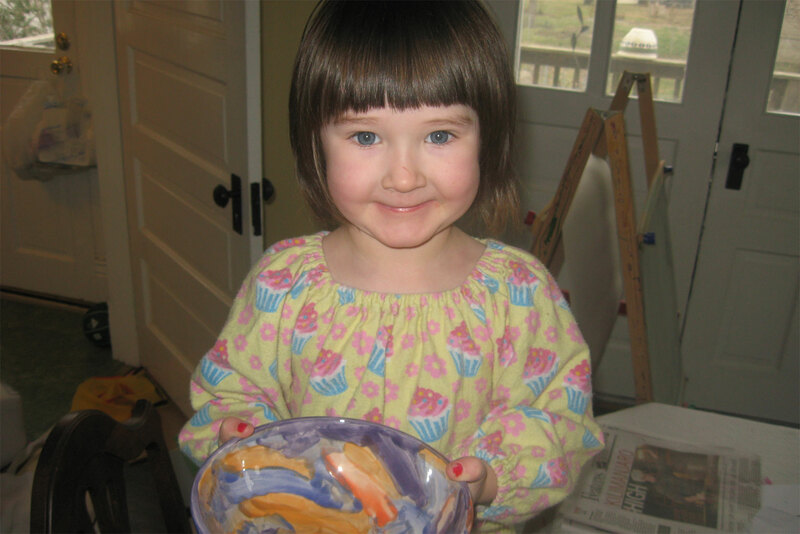 I took her to a paint-your-own pottery place, and she spent a painstaking hour meticulously covering every millimeter of a cereal bowl in her selected paints. Unfortunately, this kind of crafting doesn’t come with the cost savings or the sky’s-the-limit creativity of projects made at home, but it’s still very heartfelt and I think he’ll love it. The store fired it for us and we got it back and wrapped it this week. Here is Dorothy (in homemade cupcake pajamas!) displaying her beautiful work before we wrapped it. With about three weeks to go in this pregnancy, I’ve also been thinking about clothes for myself after this little guy comes out. A couple weeks ago I made myself a new spring skirt out of a fun cotton bird print I’d been eyeing. I think the cut of the skirt (Simplicity 2758) will be easy to wear as my waist shrinks, and it has cute pockets that don’t show up in the picture, but should be very handy when toting around a new baby and his associated stuff. (I think the lack of pockets is often the fatal flaw of skirts.) 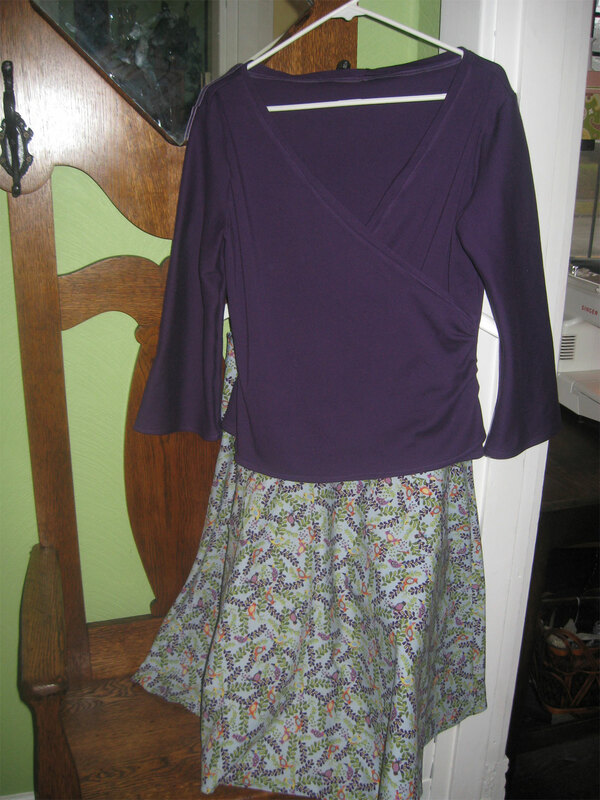 Today I made a matching cotton/spandex top (Simplicity 4076) that I hope will also be figure-forgiving and easy to wear during the post-partum season. The neck looks big to me, but I think the fabric just stretched some during sewing, and hopefully a trip through the laundry will pull it back in a bit. I’m looking forward to having something besides slouchy sweats to wear to pediatrician visits and such, because I always feel like you get treated better if you dress like a grown-up at those sort of things. I love the new outfit. You are such an awesome person and mom.